Holiday employee founds new exchange program between the US and Chile to teach young kayakers about the value of free-flowing rivers. Susan Munroe, company driver and blogger, spent the last off-season in Chilean Patagonia, writing about controversial hydroelectric development in the region of Aysén, Chile. A foreign multi-national corporation has proposed to build five mega-dams on two rivers and construct a 1,600-mile-long transmission line to carry the energy to the center of Chile. 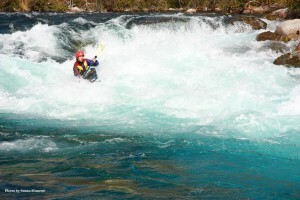 One of the threatened rivers is the Río Baker, the most voluminous river in Chile. Susan wrote about the opinions of the local communities that would be most affected by the dams. (Read her article here) Many locals did not understand the concept of a dam. They’d never driven across the Hoover Dam, or watched the Colorado River ooze to a halt in the murky waters of Lake Powell after a trip through Cataract Canyon. The region of Aysén is one of the world’s last great wildernesses. If these dams and transmission line are built, they will forever change the landscape and the local culture, and open the region to development and extractive interests. 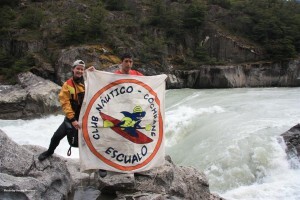 Members of Aysén’s Club Naútico Escualo don’t understand mega-dams, but they do understand rivers. For 13 years, the club has taught local kids to paddle, roll, and surf in the pristine Río Baker. “These kids are incredible,” Susan explains. 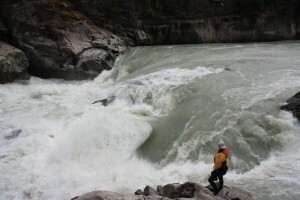 “Extreme sports like kayaking are all but unknown in this region. Most people don’t even know how to swim. And then you have these kids who are running major white water in tiny plastic boats.” The club director and local phys-ed teacher, Roberto Haro Contreras, learned to kayak from a German tourist. “Kayaking changed everything,” he says. Under his direction, over 800 children have participated in Club Naútico Escualo, which is free to everyone, and funded largely by “The ‘My Pockets’ Foundation,” Roberto laughs. The “Escualos” have a connection with the Río Baker that people who have been on a river trip will recognize. They know what it means to live on river time; they know how to go with the flow. Filmmaker Weston Boyles made a documentary about the club (see the trailer here) that highlights the joy and self-esteem the kids gain from being on the river. It was through Weston that Susan met the club and spent a month living and kayaking with the kids; now she and Weston have founded a new 501(c)3 non-profit, Ríos to Rivers, to bring these kayakers from Chile to the Grand Canyon. The Grand Canyon trip, tentatively slated for August 2013, will provide an example of the negative impacts of dams on river systems but also serve as an inspiration: the Grand Canyon was ultimately protected from being dammed. Ríos to Rivers is partnering with the Colorado Rocky Mountain School (CRMS) in Carbondale, CO. 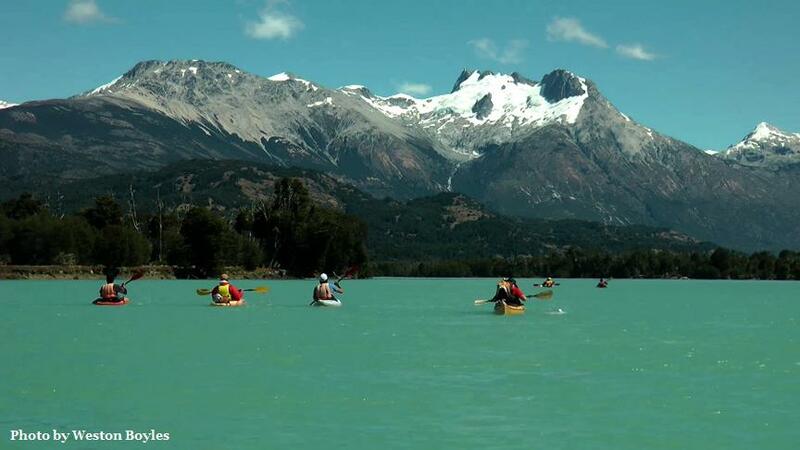 In March of 2013, eight kayaking students from CRMS will travel to Aysén, Chile, to meet the Escualos and kayak on the Baker. “We want to show the US students that pristine, untouched rivers still exist, but that that they will only remain so if people take an active interest in protecting them,” Susan says. “And if we teach the Escualos what it means to dam a river, what the environmental issues are, and what the energy alternatives are for Chile, we believe that they’ll be powerful spokespeople for the Río Baker and other threatened rivers in Chile.” Ríos to Rivers is growing the next generation of river conservationists. Ríos to Rivers is holding fundraising events in Salt Lake City (Oct. 25 at Momentum Climbing Gym) and Aspen (Nov. 1 at Colorado Rocky Mountain School), and Susan and Weston are working hard researching grants and other ways of securing funds to make the exchange a reality. If you’re in the area, please stop by to see Weston’s film “Los Escualos,” see photos and hear stories from the Río Baker, listen to presentations by leading energy experts, or just enjoy meeting other river runners and activists. Visit www.riostorivers.org for more details about these events or to sign up for the Ríos to Rivers newsletter. 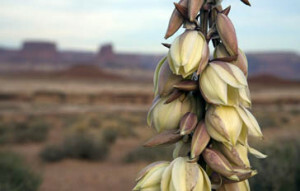 If you’d like to make a tax-deductible donation to Ríos to Rivers, please visit http://www.riostorivers.org/donate.html. The Grand Canyon portion of the exchange will cost approximately $4,900 per student; this includes airfare from Chile to the US, fees associated with passports and visas for the Escualos, and 12 days of food, gear, and support on the Grand Canyon. Ríos to Rivers plans to bring eight Chilean kayakers and two of their coaches. It’s a big number, but the payoff will be even bigger: an informed and passionate corps of young river runners ready to speak up for dam-free rivers! Every little bit helps. Thank you for reading, and thanks for your support!